El Salvador: America’s great Cold War success story and the model for Iraq’s fledgling democracy–if one ignores the grinding poverty, the corruption, the spiraling crime, and a murder rate ranked near the top in the hemisphere. This is where Jude McManus works as an executive protection specialist, currently assigned to an American engineer working for a U.S. consortium. Ten years before, at age seventeen, he saw his father and two Chicago cop colleagues arrested for robbing street dealers. The family fell apart in the scandal’s wake, his disgraced dad died under suspicious circumstances, and Jude fled Chicago to join the army and forge a new life. Now the past returns when one of his father’s old pals appears. The man is changed–he’s scarred, regretful, self-aware–and he helps Jude revisit the past with a forgiving eye. Then he asks a favor–not for himself, but for the third member of his dad’s old crew. Even though it’s ill-considered, Jude agrees, thinking he can oblige the request and walk away, unlike his father. But he underestimates the players and the stakes and he stumbles into a web of Third World corruption and personal betrayal where everything he values–and everyone he loves–is threatened. And only the greatest of sacrifices will save them. harbored briefly on its way to Troy. reclaim the bow, and bring both the weapon and its owner to Troy. reenlist in the cause against Troy. the globe, but at the same time being cursed with the hatred of millions. amenable to American strategic or commercial interests. self-congratulation, not to mention blatant hypocrisy. to bring freedom to the Middle East. greatness was re-forged, banishing the ghosts of Vietnam forever. however: It requires an almost hallucinatory misreading of history. where the “forward-leaning” policy they champion has succeeded. on average three to five hundred civilians a month. ensure they gained control of the constituent assembly. by a prominent American public relations firm. D’Aubuisson was elected its leader. concession he made to American demands. Washington knew to be crucial to its counter-insurgency strategy. millions of dollars trying to keep from power. cash, the government was in a stalemate with the Marxist guerrillas. their housekeeper, and her fifteen-year-old daughter. 90 percent of them murdered by their own government), the U.S.
the distortions of political memory took over. of a lot better” now? • Child labor remains endemic. women and children trafficked for sexual exploitation. gangs founded by Salvadoran immigrants in the U.S.
are controlled by former military men with dubious pasts. Those who have stayed behind have become increasingly frustrated. again coming apart at the seams. in gunfire, with two police officers killed and ten wounded. was available (and subsequently retreated from this position). issue)–is this truly a sane model for a stable state? an almost eerie simulacrum in Iraq, with even ghastlier results. as American efforts to stem the Iraqi insurgency foundered, U.S.
who like ordinary Salvadorans realize the future lies elsewhere. power and innocence too fatuous for an adult mind to entertain. And who has steadfastly imitated this strategy? The jihadists and insurgents in Iraq. Sophocles could have devised it more neatly. kill Soto out of some vague, illogical family rancor. of evidence existed concerning the gun and bullets. with impunity? But such arguments did not prevail. after all, blessed by God and history. How can we not prevail? a selfless, agonizing act of love. "Oscar Wilde once quipped that the truth is rarely pure and never simple. 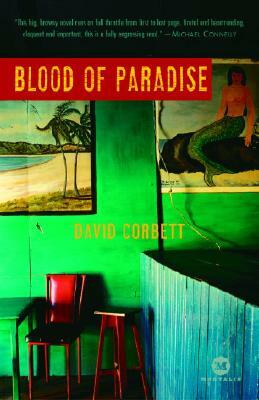 Amen to that, says Blood of Paradise, David Corbett's powerful and deeply unsettling novel of Americans attempting to navigate the perilous waters of post-civil-war El Salvador. . . . Though Corbett's novel is as fast-paced as a political thriller and as blood-drenched as a Quentin Tarantino opus at its twisted best (or worst), his aspirations extend far beyond a place on this summer's beach reading list. In a concluding coda labeled "Dossier," the author writes that he drew several themes of the book from Sophocles' "Philoctetes," in which the son of Achilles is corrupted by a cunning Odysseus. And Blood of Paradise is a novel with a political viewpoint. The Dossier is subtitled "From Troy to Baghdad [Via El Salvador]." To those Bush administration officials who have proposed that El Salvador's movement from armed struggle to elections can serve as a model for Iraq, Corbett's Central American tableau responds with "God help us." . . . The plot is complex, multilayered, at times vertiginous. . . . With all of that, the central character of this tale is the land in which it unfolds . . . Corbett writes knowingly and often lyrically of what El Salvador looks, sounds and feels like: its heat, its plants and animals, its foods, its beaches and lagunas. . . . There were times when character development defered to the hurtling plotline and political message. But that has also been true of John le Carre's more recent and ideologically loaded fiction, such as The Constant Gardener, or of Robert Stone's Damascus Gate. Yet I found those books riveting, and Blood of Paradise should feel at home in their company." "This is, above all, a serious novel. Serious, of course, is not always good. Serious can be deadly dull. But seriousness, when combined with moral concern and novelistic talent, can produce outstanding fiction. A number of writers . . . provided advance praise for the novel, and some compared it to works by Graham Greene and Robert Stone that have also explored Americans caught up in troubling events in distant lands. The comparisons are apt. I would say of Blood of Paradise what I said of Done for a Dime: If you accept its politics, if you don't find it too dark or disturbing, it's an example of the best in contemporary crime fiction—or, if I may be so bold, in contemporary fiction, period."